I was a little sore yesterday from my 10 mile hike on the AT/BMT on Saturday. So it was a relief to get back at it with Chest, Shoulders & Triceps–no pull ups or curls! Just lots & lots of push ups. But at least those don’t hurt at the moment. Kidding aside, it really was a relief to just focus on an entirely different muscle group. I just need to get through the remainder of this week, easing up on the pull up thing, and then I’ll be in recovery week again, allowing my arms to heal up. Hey check out those shoes! 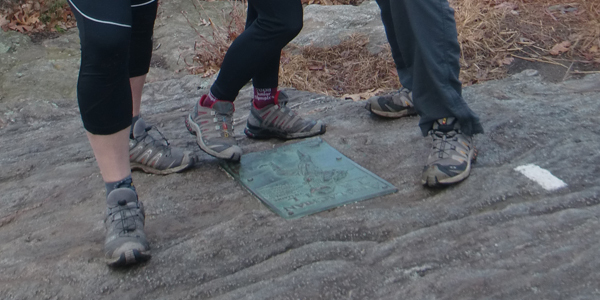 Everybody’s wearing Salomons at mile 0.0 of the AT! This entry was posted in P90X-Insanity Hybrid, Round 3 and tagged Ab Ripper X, Appalachian Trail, Calories, Chest Shoulders & Triceps, Heart Rate, P90X-Insanity Hybrid. Bookmark the permalink.